What good is a secret if you can't share it with someone?!? Halloween night I was itching to brag about my secret identity. I just had to tell somebody! But who? I decided, before reading Renee Zamora's blog for the day, to share it with an old spook at the City/County building. He's helped me with some client research, so I kind-of owed him. 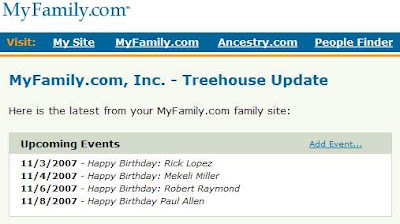 Employees at The Generations Network (TGN) were reminded of Paul Allen's early role at the company this week when the TGN Treehouse website on myfamily.com sent out a reminder of upcoming birthdays. Allen's current project is WorldVitalRecords.com, which he says is doing well. Happy Birthday, Paul! E-mail reminding employees of Allen's upcoming birthday. Problem: The Highland Utah Stake is not listed as being in a temple district that is now live or in the rollout process. Resolution: Members of the Highland Utah Stake have been given permission to register with the new FamilySearch even though their temple district is not live. If they have problems or questions, it is all right to assist them. Copyright 2007, Intellectual Reserve, Inc. The Church and FamilySearch are working to fulfill Woodruff's plea to "open ... new avenues of information [to the many outside the Church] and place in their hands the records of the past." In light of Woodruff's prayer, it makes sense that the Church would, to the extent they can afford it, give their records away to those outside the Church. So where does Ancestry fit in? I used to think I understood the relationship between FamilySearch and Ancestry. As I've learned more, I've come to appreciate that all but a hand-full of people judge one or the other with very few of the relevant facts. Sure, I'm disappointed that FamilySearch doesn't interpret Woodruff's prayer as a mandate to give Ancestry all their records for free. :-) Still, comments from Ancestry's Sullivan and FamilySearch's Rencher give me faith that the two parties can find ways to cooperate that advance the different goals of each party and—more importantly to you and me—benefit the genealogy community as a whole. Sure... give Ancestry all of Family Search's records... then watch the annual cost jump 300%. Yah, I haven't made it much of a secret inside either TGN or FamilySearch. Now you have to try and figure out which executive gave me encouragement to start. BTW, thanks for your late nights this weekend. I'm looking forward to another exciting week upcoming! You've noticed that too, have you? I can tell you that Ancestry has experimented with lots of different pricing models, none of which are entirely satisfactory. The part of the equation you don't see is the cost side. Even content available for free elsewhere costs us to acquire, prepare, index, store and serve. If we're delivering more to our customers and if its costing us more, shouldn't the price we charge increase? But if some customers don't want or need new stuff, should we break new stuff into separately priced pieces? But don't separately priced pieces lead some customers to feel like we're always hitting them up for more money? What does the price increase do to users on fixed incomes? Would we make more money by not adding more content? Given the need and desire of genealogists to form communities, shouldn't we allow customers to contribute content? Hosting the community and its user-contributed content costs us; shouldn't we charge for it? Given our cost model, do we need to charge like your local health gym/spa? Ever try to get your money back from one of them? Or should we try the revenue model of a magazine? For long time users, the benefit model is much like a magazine subscription, but the cost model is not at all like a magazine. What role, if any, should advertisements play? Can they allow lower pricing for subscribers? Pre-dot-com bubble bursting, they might have made subscriptions free, but times have changed and the perceived value of online advertising has as well. What role--if any--should free subscriptions play? Do we continue providing charity to industry projects such as RootsWeb, FreeBMD, USGenWeb, Cyndi's list and thousands of other genealogy websites? Do the costs generate adequate good will? If not, can they be monetized adequately or should they be set adrift to survive on their own? How do we service both institutional and personal markets without cannibalizing one or the other? Should the more desirable (as defined by the shareholders) of the two be allowed to entirely consume the other? What problems are added by International expansion, foreign currencies that float against the dollar, differing expendable incomes, etc.? Not only is the absolute cost of an all-features subscription lower today than it has been in the four years I've been tracking it, but I venture to guess that the cost per record is the lowest it has ever been in the history of the company, and getting cheaper and cheaper, month after month. So while the wide-spread feeling--even personal experience--makes it feel like Ancestry is always raising prices, it is simply not true. You should expect to see continued price experimentations for ever. And be assured that today Ancestry is a better deal than ever. I agree with everything you said here. Ancestry offers a fine product and gives free server space to Rootsweb, Cyndi's List, many GenWeb sites etc. We all really appreciate that. I would not mind paying Ancestry at all IF they did not take my credit card number an hold it hostage. I would not mind paying Ancestry at all IF they would not remove content from their site so that they could charge me extra to get it back again. I originally subscribed to Ancestry.com because they had so many transcribed census records. When they added the Census Images for an additional charge, the transcriptions were removed from the site. Yes, I know that the images are now part of the (higher)subscription price. My point it that information already on the site that I was paying for was removed. If Ancestry is concerned about my genealogical research and not about just making a profit at my expense, why would the transcriptions be removed? Transcriptions...even with errors...can be compared to the images and corrected and I could save a lot of time making a correction instead of re-typing the entire record for my database. If I could log in with my subscriber name and cancel my subscription, I might then trust Ancestry with my credit card number again. I can sign up online to spend money at Ancestry. I can only stop spending money at Ancestry.com by making a telephone call and arguing about why I want to stop spending money. I was assured by Ancestry that I would be reminded annually that my card would soon be charged for an new subscription. I was reminded once in 8 years. The only way I was able to get out from under my subscription was to cancel my credit card and not give Ancestry the new number. Then they certainly remembered how to contact me! I conveniently "forgot" how to hit reply. I would love to subscribe to Ancestry again. Sometimes I really need access to their databases, but until they offer me some better control over who has access to my credit card number, that won't be happening. "If I could log in with my subscriber name and cancel my subscription, I might then trust Ancestry with my credit card number again. I can sign up online to spend money at Ancestry. I can only stop spending money at Ancestry.com by making a telephone call and arguing about why I want to stop spending money. " The statement/mind set of FamilySearch giving it's records to Ancestry doesn't make sense to me...FamilySearch is not the 'owner' of any of it's original records (speaking about records acquired through archives and other repositories), the archives where they got the records are the 'owners.' In order for FamilySearch to give records to Ancestry would be in direct violation of many agreements with archives and other institutions. I think Ancestry and FamilySearch will find a way to work together, but the beautiful thing is FamilySearch will be working with many outside groups (Footnote, NARA, etc.). I called the number to cancel and was suprized that there was no attempt made at all to talk me out of canceling. I was secretly hoping to be offered a free month or a lower price or something. But no. At least, when you want to cancel it's easy to do. AncestryInsider said " The part of the equation you don't see is the cost side. Even content available for free elsewhere costs us to acquire, prepare, index, store and serve. If we're delivering more to our customers and if its costing us more, shouldn't the price we charge increase?...." Ever thought of becoming a non-profit? Why do you have to make extra profit for shareholders? Ancestry.com is a fraud. The price jumped and I had to cancel my credit card or my account would be wiped out! I had $439.87 and I called Chase and it was stopped immediately. Documents are not accurate and transcripts removed. I'll search on my own. It's accurate and cheaper!